UB’s GRoW Home, a student-built solar home that traveled across the country to place atop the 2015 Solar Decathlon, was reassembled behind Hayes Hall. 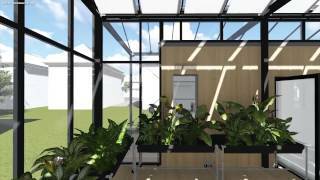 The sustainable living project, designed and built by more than 100 students across the university under the leadership of the School of Architecture and Planning, placed second in the U.S. Department of Energy’s national intercollegiate Solar Decathlon in a field of 14 finalists. Among the greatest design challenges in rebuilding the house has been adapting the foundation for a cold-weather climate and to sit level with the site. The philosophy behind UB's award-winning GRoW (Garden, Relax or Work) Home. An award-winning university project is returning home to the South Campus. UB’s GRoW Home, a student-built solar home that traveled across the country to place atop the 2015 Solar Decathlon, is now being reassembled behind Hayes Hall. Kenneth MacKay, clinical associate professor of architecture, is overseeing the reconstruction effort that stays true to the project’s beginnings as a student-led, design-build project. Students developed project drawings working under MacKay in a fall 2016 seminar and spring 2017 independent study. Last spring, students provided labor for clearing the site for the foundation through the program’s Professional Practice course. Among the greatest design challenges in rebuilding the house has been adapting the foundation for a cold-weather climate and to sit level with the site (In its first installation, the house was anchored to the tarmac of a decommissioned air base in Irvine, Calif., for the competition). This summer’s effort to complete the foundation and install the house was carried out by students under the supervision of Stephanie Cramer, adjunct assistant professor of architecture; the school’s shop staff members Lindsay Romano, Wade Georgi and Dan Vrana; and architecture student Randy Fernando. The GRoW (Garden, Relax or Work) Home continues to benefit from support from the community after donations from more than 450 individuals and organizations propelled its success in the 2015 competition. Leadership support has been provided by Ciminelli Real Estate Corp.; Buffalo developer George Gellman; Intigral Inc.; The John R. Oishei Foundation; Larkin Development Group; LPCiminelli; Montante Solar; Robert Morris; National Grid; NYSERDA; SolarCity; UB President’s Circle; U.S. Department of Energy; and Watts Architecture & Engineering. Follow the progress of reconstruction on Facebook. When that plot of land was first cleared of the temporary building placed there, an MS architecture/planning student designed a roofed garden promenade for the space — never built. With the large land footprint available, there is space to place that walkway, along with the GRoW house. The arbor-like architectural renditions may still be available.